This May Wittenborg University of Applied Sciences has its highest growth in new student intake for the past year. Compared to May last year, student numbers have almost tripled. Percentage wise the growth (184%) was even higher than the September intake (18,7%), though in actual numbers there were more students who started at Wittenborg in September 2017 than in May 2018. Some of the new students attended Introduction Day on Thursday, affirming Wittenborg’s international reach with 37 students from 15 different nationalities. They were from the Ukraine, Sri Lanka, Vietnam, Egypt, Russia, Nigeria, Turkey, Iran, South Africa, China, Pakistan, Nepal, India, Ethiopia and Bangladesh. The students were welcomed by Wittenborg’s chair of the executive board, Peter Birdsall, who encouraged students to express their opinions and said he maintained an open-door policy if they would like to talk. “Work hard and we will also try to make you proud of us. Hopefully we will have a great relationship.” Students also got to meet staff during an informal lunch. 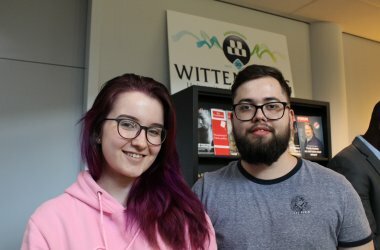 According to Ukranian students Irina Matveeva and Serhii Matvieiev, Wittenborg’s flexible entrée dates was definitely one of the draw cards when they considered a institute of higher education in the Netherlands. “My first impression of the Netherlands? It’s so beautiful and exciting,” said Matveeva who arrived a couple of days earlier. She also listed the country’s great migrant policy and affordable tuition as one of the reasons she chose to study here. Matvieiev said he did not find universities in the Ukraine to his liking and decided to give the Netherlands a go. Both of them are staying in Rotterdam.